THREE 5 AND 6 is a vocal band from Sacramento, CA. They are the innovators of a new music style, Urban A Cappella that utilizes the human voice to incorporate the sounds of the street (gospel, hip-hop, funk and rap) into energizing, danceable music. This all male group imitates the full depth of instrumental sounds found in a classic R&B or funk band as opposed to the traditional "blended, one-voice" A Cappella sound. Their powerful beats and bass drive a truly dynamic musical experience that fully engages the listener. THREE 5 AND 6 performs their own original music with a writing style that displays a wide range of influences from Stevie Wonder and The Gap Band to The Roots and KRS-One. The five young men in California-based Three 5 and 6 have only been singing together since October 2000; but individually they have performed professionally for years throughout the United States and Europe. Collectively, they have performed on over 30 albums covering styles ranging from gospel and jazz to rap and hip-hop. 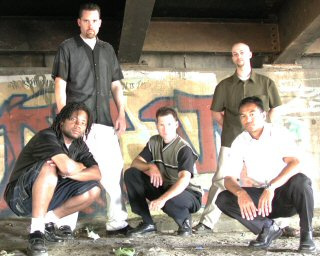 "Urban A Cappella" is their debut CD, Gospel in message, and jazz, rap and hip-hop in style. 14 mostly original songs, some of our favorites: "radiant love," "strong enough," Stevie Wonder's "higher ground," "gotta get him," the rhythmic gem "universal beat box," the powerful "unity" (written the day after September 11th), "just a minute (extended)," "can you feel it?," the salvation from drugs testimonial "cold turkey," and the beautifully arranged hymn "stand up, stand up." Strong vocal percussion, smart street words, a fresh, spirited sound: "Urban" is an amazing, innovative debut Christian CD!